No artificial flavours. 100% nutritionally complete. 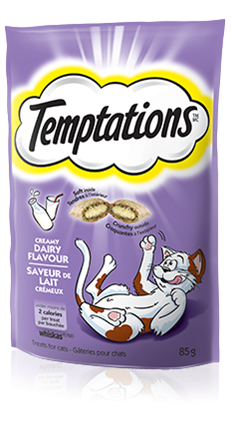 TEMPTATIONS® Creamy Dairy is rated4.7 out of5 by80. Rated 5 out of5 bySANDYCON_3701414781 fromMy cat is extraordinarily fussy and pampered. She usually turns her nose up at treats that are crunchy or hard. She was very eager to sample these delights and happily ate the few that I rewarded her with for not climbing my screens. My cat looked for more, which indicates to me that this product was a hit in her books! I had to hide them in my pots and pans cupboard and dolled out a few each day until they were gone, at which point I purchased a full size pack as my cat was hooked and I didn't want to deny her earthly pleasures. Rated 5 out of5 byBarry788 fromTreats are all he eats....I just received my free coupon in the mail. Thank you. My cat Micro is such a picky eater. I have tried many of the cat foods offered on the market ...even sliced Turkey at the lunch meat counter...and some he may completely ignore or others try once and then ignore. Yet I can count on him to devour any flavor of Temptation I offer him. He is now 2 years old and has been enjoying Temptations with each meal. Not unusual for him to go thru 4 to 6 bags a week. Have to mix the favors daily to keep his interest but it works. 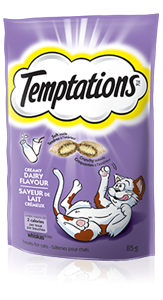 Rated 5 out of5 byKIMMON_3701400196 fromWe have previously purchased several other flavours of Temptations. Our cat seems to like all the flavours. However, for this particular one - the Creamy Dairy flavour - he pounced on it and seemed much more enthusiastic when eating it. I gave him one of the other flavours that we had on hand to see the difference and he definitely seemed to like this one better. Therefore we will be purchasing this flavour in the future. Rated 5 out of5 byjoann fromexcellentthe ONLY treats my 15 year old cat will eat...she has lost a lot of weight due to her age and I think the only thing keeping her alive are the two table spoons of dairy treats she gets everyday. she loves them !!! my other cat is 13 years old and eats all the different flavors and sits like a dog would while waiting for me to get out the treat bag. Chicken By-Product Meal, Ground Corn, Animal Fat (Preserved with Mixed Tocopherols), Dried Meat By-Products, Brewers Rice, Wheat Flour, Natural Flavour, Grain Distillers Dried Yeast, Potassium Chloride, Titanium Dioxide Colour, Choline Chloride, Skim Milk, Salt, Taurine, DL-Methionine, Calcium Carbonate, Vitamins (Alpha Tocopherol Acetate [Source of Vitamin E], Vitamin A Acetate, Niacin Supplement, Vitamin B12 Supplement, Riboflavin Supplement, Thiamine Mononitrate, d-Calcium Pantothenate, Vitamin D3 Supplement, Biotin, Pyridoxine Hydrochloride [Vitamin B6], Folic Acid), Minerals (Zinc Sulfate, Copper Sulfate, Manganese Sulfate, Potassium Iodide), Mixed Tocopherols (A Natural Preservative), Dried Cheese.